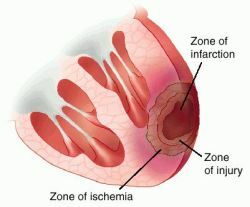 Myocardial infarction may present with crushing chest pain . The chest pain may radiate later to the left arm and the jaw. The chest pain will last more than 30 minutes and may follow with accompany symptoms such as nausea, vomiting, diaphoresis and dyspnea.Generally myocardial infarction is treated with coronary angiography and thrombolytic therapy. Certain individuals are at risk of developing myocardial infarction which include smoker, male, elderly, middle age, hypertensive patient , post menopausal women and hypercholesterolemia patient. Myocardial infarction occur as a result of atherosclerosis, vasospasm, embolus and thrombosis of the coronary artery which lead to coronary artery occlusion. The complication of myocardial infarction may develop a few days, later which include fibrinous pericarditis ( 5 days), congestive cardiac failure, rupture of the ventricular wall, thromboemebolism, shock, pulmonary edema and cardiac tamponade ( 6- 11 days), autoimmune fibrinous pericarditis ( Dressler syndrome), mitral regurgitation and rupture of the papillary muscle may occur several weeks later post myocardial infarction. Pathologically during the the first 3 - 12 hours there will be edema and hemorrhage as well as wavy fibers of the myocardium. 12- 36 hours later may present with infiltration of the neutrophil, coagulative necrosis and muscle hypereosinophilia. Granulation tissue formation, phagocytosis of the dead cells and infiltration of macrophages are commonly present during the 5 - 10 days. 2 months later scar tissue will be formed. Laboratory investigation may reveal , raised cardiac enzyme troponin I, CK- MB and AST. ECG may reveal ST elevation with permanent Q wave. 1.Reichlin, Tobias, et al. "Early diagnosis of myocardial infarction with sensitive cardiac troponin assays." New England Journal of Medicine 361.9 (2009): 858-867. 2.Davies, M. J., N. Woolf, and W. B. Robertson. "Pathology of acute myocardial infarction with particular reference to occlusive coronary thrombi." British heart journal 38.7 (1976): 659-664.